1. What in god's name was this show? 2. I could not stop watching it. There aren't too many things I'm willing to watch that are willfully confusing--or artsy for the sake of artsy. But this definitely falls into this category. 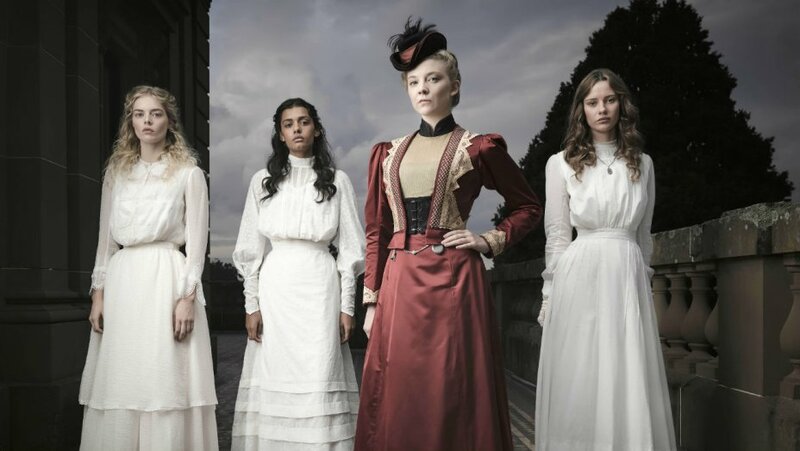 Worth watching for Natalie Dormer's wardrobe alone. Picnic tells the story of a sketchy woman, Ms. Appleyard (Natalie Dormer) who flees from a mysterious background to start a finishing school for troubled girls in an absurdly beautiful estate. Like when you have fantasies of living in some Harry Potter boarding school, this is the estate you're thinking of. Three girls disappear during a picnic and the rest of the series attempts to cover what swirls around this scandal. Were they murdered, did they disappear, or did something mystical happen? Honestly, the plot is interesting enough to keep things moving, but the plot wasn't really why I kept watching. The series has interesting themes about the ways in which women are bound, sexuality, and class. But ultimately I watched this for the visuals and an arresting score. The visuals are dreamlike at times, and the scenery varies from this sumptuous estate where the school is, to these scenes from the landscape at Hanging Rock itself. The score is sometimes intense and deliberately unnerving (reminiscent of The Witch). Newer PostTrust me, the morally reprehensible things I say and do aren't reflective of me as a person.